I should probably warn you that you’ll be seeing lots of stir-fries around here from now on. That’s because not only did Robert give me a wok as part of my Christmas gift, he also surprised me with TWO stir-fry cookbooks this week. When deciding what to make this weekend I knew I wanted to try one of the recipes. But where to start? I went right for my favorite–chicken with broccoli. It’s what I almost always order at Chinese restaurants, but have never attempted to make on my own. Frankly, I didn’t even realize that chicken with broccoli was a stir-fry. But it is–and it’s so easy to make. From previous experiences, I’ve learned that your best bet when making stir-fry is to prep everything beforehand (measure liquids, cut veggies and meat, etc.) since everything cooks so quickly once you turn up the heat. It turns out that I am no genius. When reading about stir-fry techniques in the fronts of my new cookbooks, both mention doing exactly this. It even has a fancy French name (which makes me extra happy): Mise en place–having all of the ingredients prepared and ready before you start cooking. What I love so much about stir-fries is that it takes the normal healthy ingredients that I tend to cook with–fresh veggies and lean proteins–and cranks things up about 20 notches with punchy and exciting sauces. This recipe does just that plus adds the wonderful crunchy/chewy texture of bamboo shoots. Even better: The leftovers taste just as good as those that come out of white takeout containers the next day and there’s not a drop of MSG in sight. In a medium bowl, whisk together cornstarch and wine. Add chicken and mix to coat. In a small bowl, whisk together the soy sauce, hoisin sauce, sugar, and 2 Tbsp of water. In a wok or large pan with tight-fitting lid, heat 1 tbsp of oil over high heat until hot, but not smoking. Add broccoli and cook, stirring, for about 30 seconds. Add 3 Tbsp water, reduce heat to medium, and cover the wok/pan. Cook, stirring occasionally, until broccoli is crisp, but tender–about 2 to 3 minutes. Transfer broccoli to a bowl. Add remaining 3 Tbsp canola oil to the same pan and return heat to high. Add ginger and garlic and stir until ginger and garlic sizzle. Stir chicken mixture and add to the pan. Cook, stirring, until chicken turns white, about 2 minutes. Discard ginger and garlic. Reduce heat to medium and add soy sauce mixture. Stir to coat chicken. 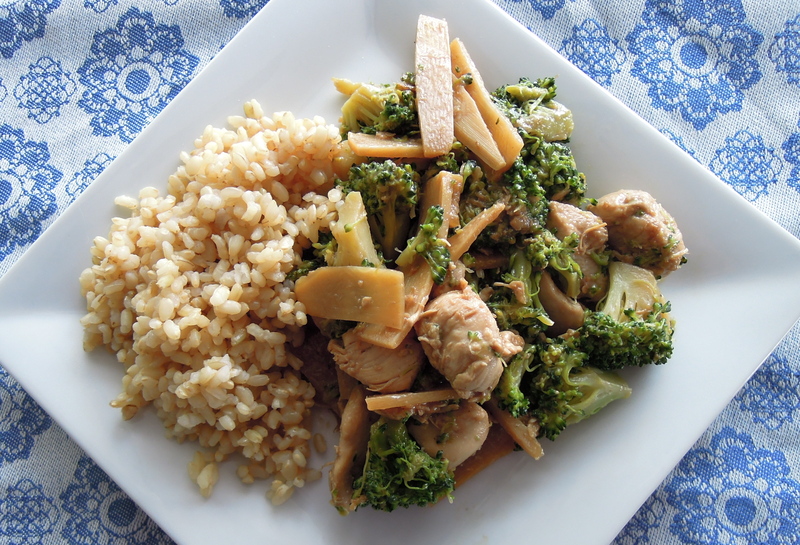 Add the bamboo shoots and broccoli. Stir until all ingredients are heated, coated, and chicken is cooked through. Drizzle with sesame oil and mix. Serve immediately with brown rice. This entry was posted in Chicken on January 22, 2012 by Paige Greenfield.